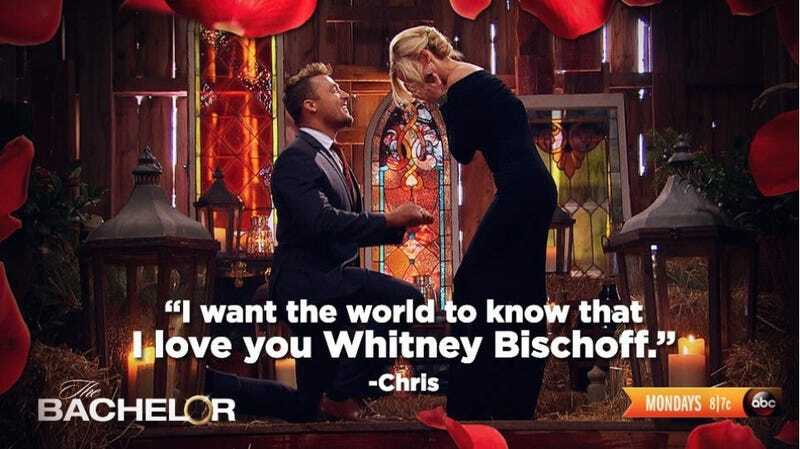 Sad news for Bachelor Nation: last season’s Bachelor Chris Soules is no longer engaged to Whitney Bischoff, the girl who promised she’d leave her job in Chicago where she worked at a fertility clinic to live in a town with a population of less than 500 people because she wanted to settle down and raise a family. Bachelor creator Mike Fleiss announced the news on Twitter, which prompted Reality Steve, who has been reporting on rumors of the demise of this particular couple since before the season even finished airing, to let out one small gloat. Bischoff had been supporting Soules during his attempt to be the next Dancing with the Stars champion, but she hadn’t yet moved to Iowa to live with him on his farm. During that time, there was plenty of gossip alleging that Chris was getting a little more than friendly with his dance partner, who is also conveniently named Witney. That didn’t mean that the couple didn’t put up a good front. Just a few weeks ago, they showed off Whitney’s trip to Chris’s farm via the ultimate love app, Instagram. Good thing we still have Kaitlyn. Update: A source says that around 3 pm CT today, Chris and Whitney were spotted eating together at Wells on Wells in Chicago. No word on what the two were/are discussing, but a photo provided to Jezebel shows them sitting across from one another at a table like people do.